QUENTIN KELLEY – I started playing with tools around age 3 in my grandfather’s basement workshop. In hindsight, that should have been a clue as to the future career. I continued with tools helping my father build the western MA house that I grew up in. We framed, did finish carpentry, cut trees, split firewood, built stone walls, etc. I survived an engineering program at Cornell University. Then I spent 2 years as a Peace Corps volunteer in the Dominican Republic, working on water systems and latrines. All the while, in the back of my head, was this vague notion of designing and building in wood. So, I built some furniture while I was there, and began to think about a career change to woodworking. At Dixon Brothers Woodworking in Boston’s South End I learned woodworking fundamentals, while building many, many doors and other architectural elements. I then spent some time with Rhode Island furniture maker Hank Gilpin, who taught basics of furniture design, construction, and history, and most importantly how to run a small workshop. 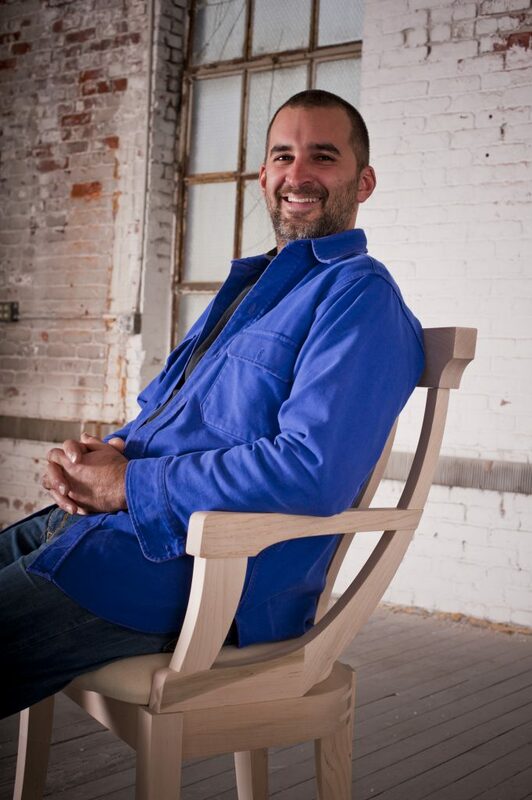 Since 2006, and with some help, I’ve been making high quality, original modern furniture and other custom woodwork. I enjoy the challenges of being a designer, builder, and business owner. The range of skills and tasks required, everything from machine maintenance to marketing, makes each day interesting and challenging.